Video Enhancer 1.7 - Increase you video quality, convert your SD video to HD. Optimized your video: einterlacing, denoising, deshaking, color correction, sharpening, visual effects etc. Fx MPEG Writer 9.7.24 - Convert video files created by digital cameras, HD TV capture devices and other digital video devices to MPEG-1, MPEG-4 or to any AVI format. Movavi VideoMessage 2.0 - It lets you create video postcards and provides 11 professional and 15 holiday video frames, you can add personal text messages to customize the frame and convert video messages to formats suitable for sharing via email and blogs. AVD Video Processor 7.5 - Capture snapshots from video files and create professional-looking GIF animations. Blaze Media Pro 7.0 - All-in-one software for audio and video editing, audio conversion, video conversion, audio CD ripping, audio CD burning, video CD burning, data CD/DVD burning. EnhanceMovie 2.2 - Easy-to-use video enhancement software helps you clean up noisy video, increase lightness, brightness or contrast, correct white balance, handle interlaced video, fix blurred or purple images and others. HT Video Editor 7.0 - A powerful piece of video editing software that can assist you in compiling a professional looking movie from your existing personal videos, digital still images, and audio files. River Past Video Slice 5.1.3 - An easy-to-use and fast video trimmer and splitter software for cutting the video to the exact frame for your editing and authoring needs. Video Charge 3.7 - A multifunction, easy in use software product for conversion of Video, Audio, or Image files sequences! Avi Divx Wmv Real Mp3 Media Fixer Pro 2.7 - Help you to Repair fix DivX Div AVI ASF WMV WMA RM Rmvb files that cannot be played or dragged. Watermark Master - a multifunctional video editor which enables you to add watermark to a movie (to its every frame) or a graphics file. Movie Title Maker - Add tilte and graphics with Real-time 3D effects to your quicktime movie. Support pixel painter and vector graphic draw. Support create objects tween animation. Video Edit Converter Pro 2.5 - Is an all-in-one video converter / editor application, it can support conversion to VCD, SVCD, DVD, MOV, AVI, WMV and Pocket PC format. 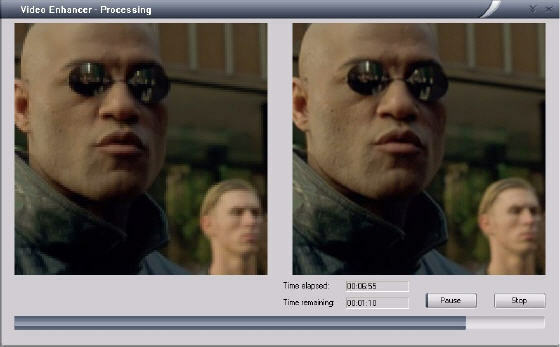 FadeToBlack AVI Video Editor 2.3.3 - Quickly and easily join, split, crop, trim, modify color, rotate, overlay / merge, blur your AVI video files, along with sequences of JPG and BMP images or photos from your digital camera. MedianSoft Joiner-Converter 3.7 - Allows merging and/or splitting all AVI (including DivX, XviD, MPEG4), WMV, ASF, VOB, DAT, MPEG files and digital photos to one AVI, MPEG, DVD, or VCD file. ImTOO Video Editor - Is a multifunctional video tool, which contains functions of Video Joiner, Video Splitter, and Video Cutter. ImTOO Video Cutter - Is a powerful video cutter tool, which can perfectly assist you to select and cut your favorite segments from one file, and merge them to a new one.